Kittitas Broadband provides a reliable internet connection for our community, supported by people who know you. Ditch the cable and dsl company for the next generation of high speed unbundled Internet. You know what you want and its not a gazillion channels or 29 calling 'features'. Call today and get what you want, working internet. Basic Internet for browsing the web and checking email. Up to 5 Mbps download + 1 Mbps upload. Basic installation is $50 see terms of service above for details. All plans include a reliable wireless router, no extra fees or gotchas or decisions. Internet service done right at a fair price. Areas in yellow are coming soon. Out of our service area? Let us know, we are expanding. 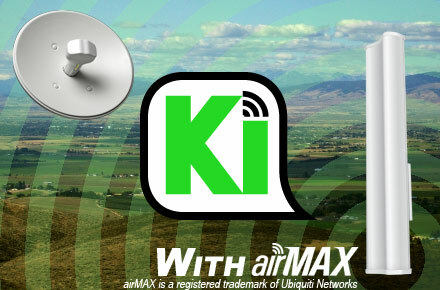 Kittitas Broadband is part of the Ubiquiti World Network a cooperative between Wireless ISP's and the Ubiquiti Networks Inc. to promote the little guys in rural broadband Internet deployment. Our network runs on the amazing technology developed by Ubiquiti, giving you the best experience you can find.